by Keith Anderson, Elizabeth Drescher. Church Publishing, 2018. How can social media impact congregational mission and ministry? Is there more to it than public relations approaches adapted from the business world, or posting newsletters online? In fact, claim a blogging pastor and a religious studies scholar, digital tools support relational, incarnational ministry. Congregations deepen and broaden their impact by incorporating these technologies into community culture. 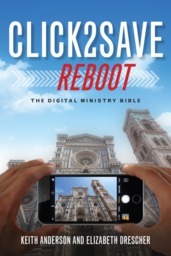 In the second edition or “reboot” of Click2Save, readers discover the “arts of digital ministry” and practical guidance on using social networking technology. For example, learn step-by-step how to use YouTube’s free video editing capabilities. A discussion of major platforms including Facebook and Twitter describes characteristics and features you can use. Profiles of practitioners such as Nadia Boltz-Weber and the Massachusetts Council of Churches show how it is done. And an updated resource list includes books, podcasts, blogs, and websites for further enrichment. This is a must-read for 21st Century leaders and communicators.